I don’t know about you, but one of the things I used to love the most about holiday dinners was the stuffing; that, and my strange combo of mashed potatoes and mustard pickles. Hey, don’t knock it till you try it. I was lucky enough to come from a family who took their stuffing seriously. I never even had the pre-made stuff until my thirties. (Obviously, would NOT recommend that stuff.) Back home, my family was always trying a bunch of different things in their stuffing recipes, sausage, fresh herbs, nuts, berries and I enjoyed it all. Add some delicious gravy and I swear I would have been happy with a plateful of stuffing. Well, now that I’m all grown up, I can do that! And now, you can too because I created this delicious, plant-based, glorified stuffing recipe to enjoy as a main meal. It has bread in it, but it’s healthy fermented sourdough. If you’re strictly avoiding gluten, you can easily omit the bread or substitute with your favourite gluten-free variety. I used both Brussels sprouts and cauliflower in a powerful cruciferous tag team type of way. Both of these veggies are seriously healthy and seriously tasty when prepared the right way (roasting is one of the right ways…boiling would be the wrong way cause the boiling water it zaps them of their wonderful nutrients). Plus, I think the colour combination just makes it more fun too. And, because they’re both members of the cruciferous or brassica family they are loaded with antioxidants and help support your liver’s detox pathways. You’re going to be roasting this recipe on two different pans. One pan is for the nuts, bread cubes and sage, and one pan is for the veggies. This separation ensures that the crispy bits stay crispy. If you’ve never made crispy fresh sage, you’re in for a treat. It’s one of the easiest things to do and instantly ups your kitchen cred. You’ll actually want to snack on those crispy sage bits straight up, they’re THAT good. 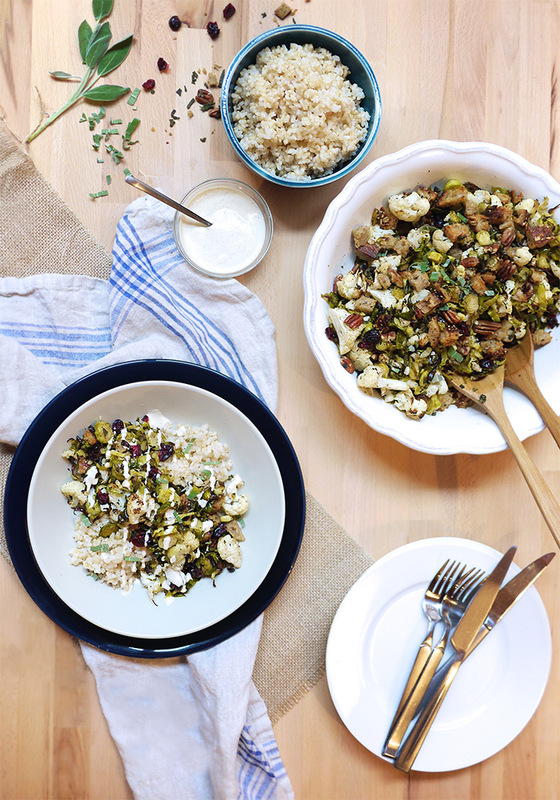 It’s the sage in this recipe that really harkens the holiday stuffing spirit. Now, you could go full boar and drizzle gravy over this, or use a creamy tahini dressing that gives it a certain level of sophistication and a hint of tartness that really brings the whole things together in a new and exciting direction. I went with the latter. I’ll include the ridiculously easy creamy tahini recipe below. Add Brussels Sprouts and cauliflower to large mixing bowl. Add 2 tbsp coconut oil + ¼ tsp salt, 1 tbsp dried sage and pepper. Combine well and pour onto large parchment-lined baking sheet in one layer (or two smaller baking sheets will work). 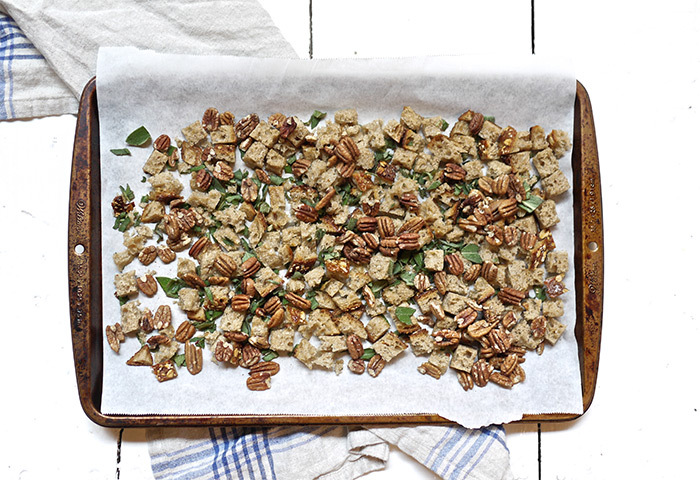 In another mixing bowl, add bread cubes, pecans, chopped fresh sage, ¼ tsp salt and 2 tbps coconut oil, mix to coat evenly (you will want to make sure everything is coated with oil so it doesn’t burn). Pour onto parchment lined baking sheet in a single layer. Put all baking sheets in the oven. The nuts/bread sage will only take about 10 minutes to brown and get crispy. Check after 5 minutes and toss around on the pan to get an even browning. Remove that pan once evenly browned (approx. 10 minutes total) and set aside. 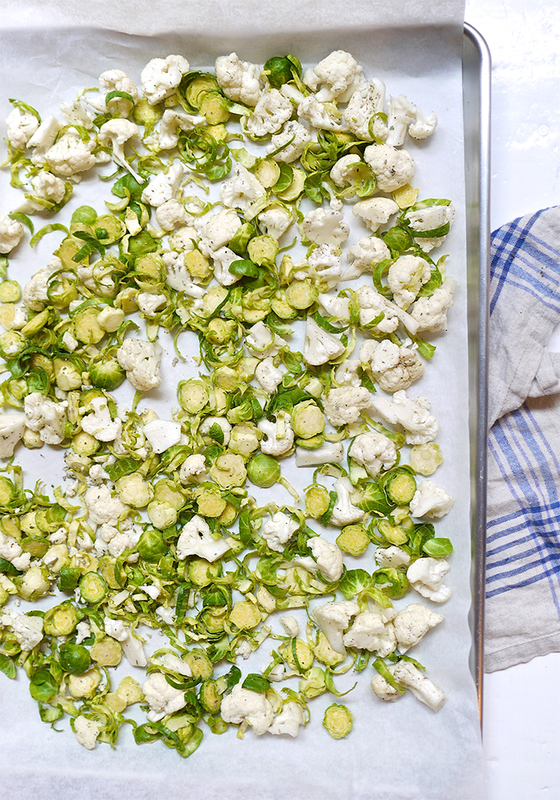 At the 10- minute mark, toss the veggies around on their tray and put them back in the oven for another 10 minutes. After veggies have been roasting for 20 minutes, increase the heat to 475 and continue to roast another 5-7 minutes until edges turn brown and a little crispy. Be careful not to burn them! Once veggies are done, remove from oven and combine veggies and bread crumb mixture together in a bowl with dried cranberries. Transfer to serving bowl and serve drizzled in creamy tahini dressing. Blend all ingredients well with blender of immersion blender until smooth. This recipe is great as a main dish or as side dish. Depends on your mood. If you want to use it as a main dish and feel it needs more, you can add leafy greens or brown rice as I did here. Enjoy!